There have lately been two solar eclipses in Cape York. It is a rare astronomical phenomenon where the moon passes across the surface of the sun (when watched from the Earth). It does not happen altogether that often, world wide there are only a few every year that are possible to see from land surface (since the oceans cover 70% of the Earth's total surface, leaving only 30% for continents). In a given place it definitely is a very rare event, and most people don't dream about seeing one where they live during their lifetime. There hadn't been any solar eclipses in north Queensland for 1,300 years. Then there was the eclipse 2012 which was a total eclipse. The 2012 eclipse was already an event of a lifetime, or rather 10 considering the 1,300 years. As if that was not enough, we had a next solar eclipse only six months later! Now that is really rare anywhere in the world!!! The second one - the 2013 eclipse - was on the 10. 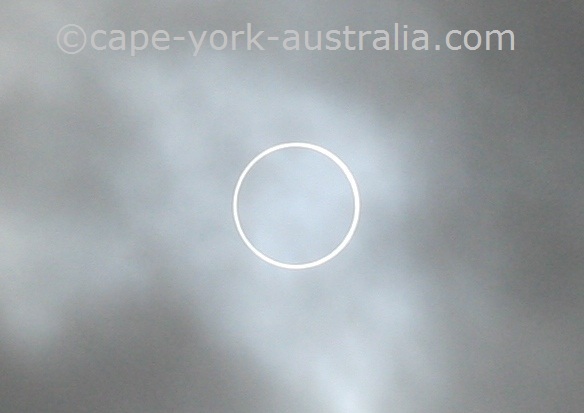 May 2013, and it was an annular eclipse, meaning it does not go totally dark, it's more like a ring (on the photo below though the background would have been dark thanks to the filter, if it wasn't that a cloud decided to filter it for me instead). I am not an eclipse chaser but I made sure I saw them both. How would you not when they are almost in your back yard??? 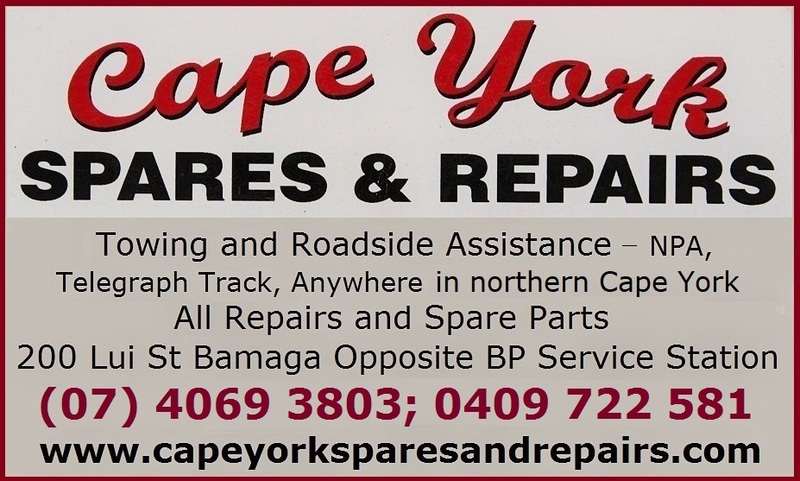 It's one of them rare events that some people sleep through but others can travel across the globe to see, and it's coming to Cape York peninsula! There have been so much talk about it, accommodation is all booked out and special events have been planned around the rare happening. But what is a solar eclipse? It's when the moon is passing between the Earth and the sun, leaving a shadow so large on the Earth that the daylight disappears in places where it can be seen. 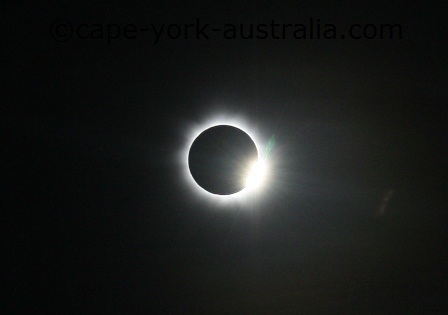 You can watch the moon gradually gliding across the sun, going through different phases known as Baily's Beads, Diamond Ring Effect and Totality. When Can the Solar Eclipse 2012 Be Seen? It's between 5.45 and 7.40am on the 14. 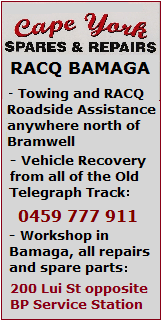 November 2012 local time (Brisbane time, UTC +10). In the most of the rest of the world it is still the 13. November. 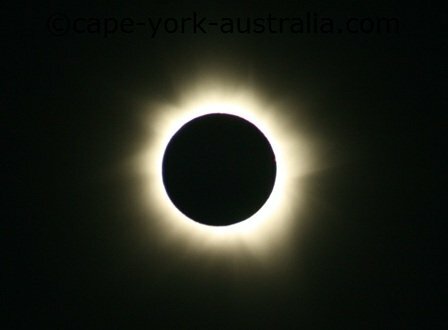 Where Can the Solar Eclipse 2012 Be Seen? 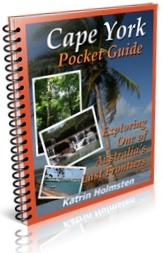 It can be seen only in the southern parts of Cape York Peninsula. The centre of it passes through between Port Douglas and Mossman in the north and Mt Molloy and Mt Carbine in the south, then moves right to the Palmer River Roadhouse, and then continues from there across some very little inhabited land inluding the northern end of Palmer River Goldfields west to Pormpuraaw. But you don't have to be in the centre to see it. 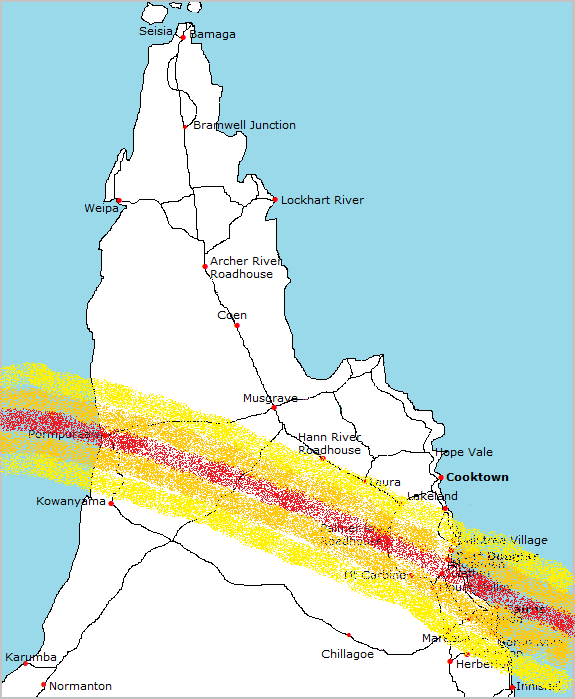 The whole area it covers is a broader belt the northern edge of which passes across Wujal Wujal, Laura and Hann River Roadhouse, while in the south you can see it as far as in Innisfail and Atherton Tablelands in the east, and Kowanyama in the west. NEW Read here what the 2012 Solar Eclipse was like! At first it seemed we had everything against us. It's the Wet Season in the wettest part of Australia. The weather prediction for the week looked hopeless. Every other day in the week had sun and more or less clear skies, but Wednesday the 14th of November had clouds over Cape York and on the coast of far north Queensland it was predicted to rain. With chances looking so slim we decided it needs to be a dry place and headed to Mareeba. There were low morning clouds above the horizon but the sun rose out of them in no time, and for the rest of the time we enjoyed the skies perfectly cloudless! Almost immediately the moon started moving across the surface of the sun, but like you see on the photo above, you cannot even see it unless you use solar eclipse glasses, or a solar filter for your camera (and you must not look into the sun without proper protection anyway). As the moon moved further and further in, the light started dimming and you could see a few stars. Temperatures dropped.. Birds went quiet and started flying to their roosting grounds. An hour later, quite suddenly, it went into the so-called Diamond Ring phase. That's when the light drops to darkness. The photos above look dark because I was using a solar filter on my camera, but the photos below were taken with no filter - that's how dark it actually was! After the Diamond Ring comes the Baily's Beads phase, where the very last of the sun's surface is seen through the moon's valleys (not so good a pic but I didn't want to spend the whole time playing with the camera - I've read some photographers saying "I have never actually SEEN an eclipse"). And then it enters the phase of totality. It is so beautiful, even emotional, and you look around and everything is in darkness - a strange, eerie darkness, different from the darkness of a night. That is the beauty of a total solar eclipse - a partial one never enters the darkness phases. You could see this eclipse from many other parts of Australia, but anywhere south of Innisfail (and north of Cedar Bay on the peninsula) it was only a partial one. 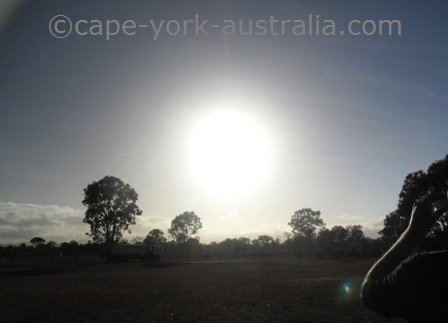 There is also a next solar eclipse coming up in Cape York, but it's not a total one.